Romney and Congress: The Republican argument for using your vote to punish Republicans. The Republican argument for using your vote to punish Republicans. 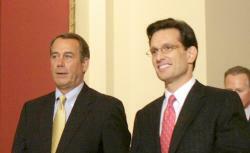 Eric Cantor and John Boehner at the U.S. Capitol on March 21, 2010. Photo by Yuri Gripas/AFP/Getty Images. In recent days, some newspapers and pundits have made one last pitch for Mitt Romney’s election. The key question, they argue, is which presidential candidate can work with the Republicans who control Congress. Obama has tried but has been rebuffed. Only Romney can get the job done. Several astute skeptics—Kevin Drum, Steve Benen, Ezra Klein, Eliot Spitzer—point out that this argument rewards intransigence. They’re right. But it also defies what Republican congressional leaders believe about conflict management. The most effective way to change the behavior of an intransigent opponent, according to these Republicans, isn’t conciliation. It’s confrontation and intimidation. The problem with the Obama defense and foreign policy philosophy is that it seems to abandon the proven strategy of peace through strength. … In this view, our most vexing issues can be resolved by adjusting our own behavior in order to compromise with our enemies. … If Iran wants to threaten the world with nuclear weapons, so it goes, it must be because President Bush refused to engage with it. And if Syria endangers our troops in Iraq and funds Mideast terrorism, we should somehow offer it more carrots and less sticks to convince it to change. The problem is that this kind of accommodating attitude toward our enemies never works. Upon taking office, President Obama took several steps to pursue negotiations with Iran. He famously suggested that if countries like Iran are willing to unclench their fist, they’ll find an extended hand from us. He recorded a YouTube message to the Iranian people. He also reportedly wrote a letter to Iran’s Supreme Leader inviting him to talk without preconditions on the basis of mutual respect. This was the engagement phase. … But instead of using this period to demonstrate progress, Iran used it to continue enriching uranium and to divide the international community. Romney, McConnell, Boehner, and Cantor aren’t talking about themselves, of course. They’re talking about leaders of other countries. But in doing so, they illuminate their own thinking. Every interpretation of another person’s behavior relies in part on projection. And because you aren’t talking about yourself, you don’t apply the usual layers of deception. That’s why the best clue to a politician’s thinking isn’t what he says about his own motives. It’s what he says about his opponent’s motives. Cantor, Boehner, and McConnell couldn’t have said it better themselves. It’s resolve that moves events. Outreach, concession, and accommodation failed. What we need now is less carrot and more stick. On Tuesday, you’re the stick.